This is a simple flannel strip quilt. It is flannel strips on the top, and solid flannel on the bottom. Nothing in the middle. So I guess that makes it more of a receiving blanket. Well, whatever it is, it is super cute! It has beautiful velvet ric rac to add dimension. It is bound with flannel bias tape. I love this project. It is pretty easy, and it looks amazing. I completed it in one morning. I’m sure you can do it even faster! Flannel for the backing. Once you have cut your strips, you will know how big your backing piece needs to be. 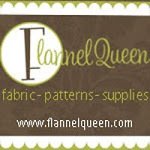 ½ inch single fold flannel bias tape, enough to go around the perimeter of the quilt. 1. Lay the strips of fabric out to come up with your quilt design. 2. Sew the strips together. 3. Iron the seams open. 4. Decide where you want the ric rac to go, and sew it on. 6. Iron your bias tape in half (so it’s ¼ inch wide now). 7. Sew the bias tape onto the quilt. I know many talented people who do binding by hand. I simply pinned the bias tape in place all around the quilt and machine stitched it on. 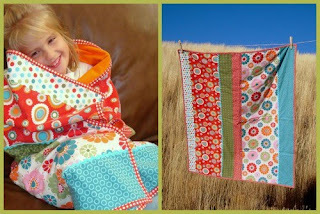 A more in depth tutorial on binding quilts is located here. Strips - Riley Blake Just Dreamy flannel fabrics: 5.5” Aqua Tonal Dots, 12” Large Flowers, 3” Small Dots on Red, 4” Olive Tonal Flowers, 9.5” Medium Flowers on Red, 3” dots. Bias Tape – I made this from the Riley Blake Just Dreamy Small Dots on Red flannel fabric.